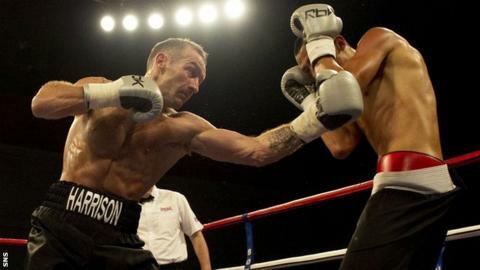 Former WBO featherweight champion Scott Harrison is aiming for a world title shot before Christmas. Harrison will appear on the undercard of Ricky Burns's lightweight title bout with Kevin Mitchell against an as-yet-unnamed opponent. The 35-year-old returned to the ring in June and knows time is against him if he is to claim another title. "I'll have the carrot of a world title fight being dangled in front of me," he said. "There could be the chance to take on whoever wins between Burns and Mitchell." Harrison returned to the ring after an absence of six years when he defeated Hungarian teenager Gyorgy Mizsei Jr.
"I still don't know who I'll be fighting at the SECC, but I've just been focusing on my training," he said. "It's a long time since I was scheduled to fight less than 10 rounds and there wasn't a title at stake, but I need to win this fight to stay on course. "I want to challenge for a world title, but I can't do that if I don't take care of whoever is put in front of me on Saturday." Harrison relinquished his belt in 2006 after failing to make the weight for a defence and checked into the Priory Clinic in Glasgow to treat problems with alcohol and depression. The Cambuslang boxer lost his licence and continued to struggle with personal problems and served two-and-a-half years in a Spanish prison after being found guilty in 2009 of assault and attempted theft of a car in Malaga three years earlier.